RUSH: By the way, the Rasmussen presidential tracking poll for today: Trump at 51% approval. The rest of the Drive-Bys discount Rasmussen. They call it a Republican-slanted poll unit. They discount it. They prefer to use CNN’s where Trump is at 43 or 44. He’s climbing, even, in the CNN poll, but he’s not at 50%. You have Trump, and you wonder: In any poll, how could Trump be at 51%? He’s fighting an unaccountable special counsel. He’s fighting current and former deep staters, a dominant radical left-wing media. He’s fighting the ChiComs’ illegal trade practices, dealing with an insane regime from North Korea, fighting to undo a deranged Iran deal. He’s fighting organized invaders coming through Mexico to corrupt the American culture. He’s fighting wannabe gun confiscators and he’s fighting Democrat obstructionists in Congress who will not move forward on confirming many of his nominees, including judges at a rate that is slower than anybody can ever remember. It’s an active shutdown of confirming Trump appointees. And yet the procedure repeats. How do Republican voters respond? They respond with apathy and anger. If you want to know why Trump is at 51% approval, it’s because Trump is Trump. It is because Trump is taking on every enemy he’s got. In many ways, in many cases, he’s doing it single-handedly. He’s doing that which Republican voters have not only longed for, but believed is required in the midst of these political battles. Scott Walker has issued a warning. There was an election in Wisconsin where a radical leftist won a judgeship. 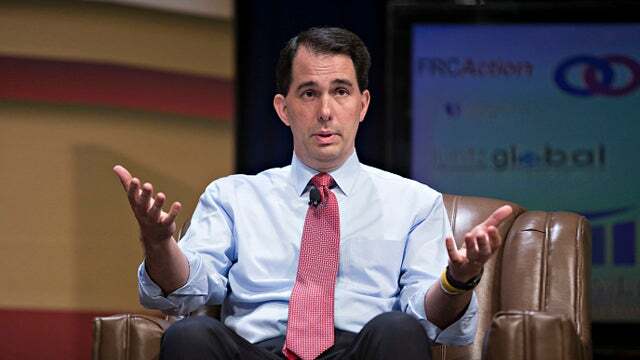 And Scott Walker says he believes that a Democrat blue wave is coming, governor of Wisconsin. He thinks there’s no question a blue wave is coming unless the Republicans get in gear and take this seriously. He said all the Democrats have is anger and rage, and the Republicans better come up with something to counter that or they’re gonna get swept. Now, he says this because he’s seeing it in his state and it’s a state Trump did well in. So something to pay attention to.